Tuberculosis (TB) or known as the White Plague during the 19thcentury, has inflicted the human race ever since. It is described as a chronic infectious disease caused by an organism called Mycobacterium tuberculosis through droplet transmission, like coughing, sneezing, or if the person inhales the infected droplet. It can be considered as primary or secondary infection depending on recovery of the client from the communicable infection. It is a reportable communicable disease and a repeated exposure to it causes a person to acquire it. According to a study conducted by Knechel, the progression of tuberculosis has several stages. Latent Tuberculosis – It is the stage of infection when the person who had been exposed to the M. tuberculosis nuclei does not manifest signs and symptoms of the disease and do not have the capacity to infect other people. The nuclei just persist in the system in its necrotic form which could stay for a long time, not until that immunosuppression or a certain factor triggers it to become its virulent form. 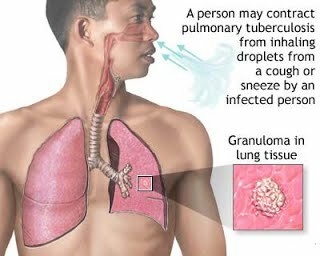 Primary Pulmonary Tuberculosis – Since the most immediate location of pathogenesis of the organism is in the lungs, primary activation of disease in the pulmonary cavity is considered. It is usually asymptomatic and only identified through significant diagnostic examinations. Only the presence of lymphadenopathy is something that is indicative for its infection. Primary Progressive Tuberculosis – It is the stage of the disease process when it is already considered as active. Clinical manifestations are evident and the client may reveal positive in sputum examination for presence of the organism. Sometimes, he or she may manifest cough with purulent sputum and some pleuritic chest pains because of inflammation in the parenchymal walls. Extrapulmonary Tuberculosis – It is when tuberculosis extends its infection to other parts of the aside from the pulmonary cavity. The most fatal location is the central nervous system and its infection to the bloodstream. Other locations may include the lymphatic system, the bones and joints and at times the genitourinary system. Identify interventions to prevent/reduce risk of spread of infection. Demonstrate techniques/initiate lifestyle changes to promote safe environment. Review pathology of disease (active and inactive phases; dissemination of infection through bronchi to adjacent tissues or via bloodstream and/or lymphatic system) and potential spread of infection via airborne droplet during coughing, sneezing, spitting, talking, laughing, singing. Rationale: Helps patient realize or accept necessity of adhering to medication regimen to prevent reactivation or complication. Understanding of how the disease is passed and awareness of transmission possibilities help patient and SO take steps to prevent infection of others. Identify others at risk like household members, close associates and friends. Rationale: Those exposed may require a course of drug therapy to prevent spread or development of infection. Instruct patient to cough or sneeze and expectorate into tissue and to refrain from spitting. Review proper disposal of tissue and good hand washing techniques. Encourage return demonstration. Rationale: Behaviors necessary to prevent spread of infection. Review necessity of infection control measures. Put in temporary respiratory isolation if indicated. Rationale: May help patient understand need for protecting others while acknowledging patient’s sense of isolation and social stigma associated with communicable diseases. AFB can pass through standard masks; therefore, particulate respirators are required. Rationale: Febrile reactions are indicators of continuing presence of infection. Identify individual risk factors for reactivation of tuberculosis: lowered resistance associated with alcoholism, malnutrition, intestinal bypass surgery, use of immunosuppressive drugs, corticosteroids, presence of diabetes mellitus, cancer, postpartum. Rationale: Knowledge about these factors helps patient alter lifestyle and avoid or reduce incidence of exacerbation. Stress importance of uninterrupted drug therapy. Evaluate patient’s potential for cooperation. Rationale: Contagious period may last only 2–3 days after initiation of chemotherapy, but in presence of cavitation or moderately advanced disease, risk of spread of infection may continue up to 3 months. Compliance with multidrug regimens for prolonged periods is difficult, so directly observed therapy (DOT) should be considered. Review importance of follow-up and periodic reculturing of sputum for the duration of therapy. Rationale: These second-line drugs may be required when infection is resistant to or intolerant of primary drugs or may be used concurrently with primary anti tubercular drugs. MDR-TB requires minimum of 18–24 mo therapy with at least three drugs in the regimen known to be effective against the specific infective organism and which patient has not previously taken. Treatment is often extended to 24 mo in patients with severe symptoms or HIV infection. Encourage selection and ingestion of well-balanced meals. Provide frequent small “snacks” in place of large meals as appropriate. Rationale: Patient who has three consecutive negative sputum smears (takes 3–5 mo), is adhering to drug regimen, and is asymptomatic will be classified a non transmitter. Rationale: Monitors adverse effects of drug therapy including hepatitis. Rationale: Helpful in identifying contacts to reduce spread of infection and is required by law. Treatment course is long and usually handled in the community with public health nurse monitoring. Rationale: Initial therapy of uncomplicated pulmonary disease usually includes four drugs, e.g., four primary drugs or combination of primary and secondary drugs. Rationale: INH is usually drug of choice for infected patient and those at risk for developing TB. Short-course chemotherapy, including INH, rifampin (for 6 mo), PZA, and ethambutol or streptomycin, is given for at least 2 mo (or until sensitivities are known or until serial sputums are clear) followed by 3 more months of therapy with INH.Ethambutol should be given if central nervous system (CNS) or disseminated disease is present or if INH resistance is suspected. Second-line drugs: ethionamide (Trecator-SC), para-aminosalicylate (PAS), cycloserine (Seromycin), capreomycin (Capastat). Rationale: Extended therapy (up to 24 mo) is indicated for reactivation cases, extrapulmonary reactivated TB, or in the presence of other medical problems, such as diabetes mellitus or silicosis. Prophylaxis with INH for 12 mo should be considered in HIV-positive patients with positive PPD test. Demonstrate behaviors to improve/maintain airway clearance. Participate in treatment regimen, within the level of ability/situation. Identify potential complications and initiate appropriate actions. Assess respiratory function noting breath sounds, rate, rhythm, and depth, and use of accessory muscles. Note ability to expectorate mucus and cough effectively; document character, amount of sputum, presence of hemoptysis. Rationale: Expectoration may be difficult when secretions are very thick as a result of infection and/or inadequate hydration. Blood-tinged or frankly bloody sputum results from tissue breakdown (cavitation) in the lungs or from bronchial ulceration and may require further evaluation or intervention. Place patient in semi or high-Fowler’s position. Assist patient with coughing and deep-breathing exercises. Rationale: Positioning helps maximize lung expansion and decreases respiratory effort. Maximal ventilation may open atelectatic areas and promote movement of secretions into larger airways for expectoration. Clear secretions from mouth and trachea; suction as necessary. Rationale: Prevents obstruction and aspiration. Suctioning may be necessary if patient is unable to expectorate secretions. Maintain fluid intake of at least 2500 mL/day unless contraindicated. Rationale: High fluid intake helps thin secretions, making them easier to expectorate. Rationale: Prevents drying of mucous membranes and helps thin secretions. Rationale: Reduces the thickness and stickiness of pulmonary secretions to facilitate clearance. Rationale: Increases lumen size of the tracheobronchial tree, thus decreasing resistance to airflow and improving oxygen delivery. Rationale: May be useful in presence of extensive involvement with profound hypoxemia and when inflammatory response is life-threatening. Be prepared for/assist with emergency intubation. Rationale: Intubation may be necessary in rare cases of bronchogenic TB accompanied by laryngeal edema or acute pulmonary bleeding. Demonstrate improved ventilation and adequate oxygenation of tissues by ABGs within acceptable ranges. Be free of symptoms of respiratory distress. Assess for dyspnea (using 0–10 scale), tachypnea, abnormal or diminished breath sounds, increased respiratory effort, limited chest wall expansion, and fatigue. Rationale: Pulmonary TB can cause a wide range of effects in the lungs, ranging from a small patch of bronchopneumonia to diffuse intense inflammation, caseous necrosis, pleural effusion, and extensive fibrosis. Respiratory effects can range from mild dyspnea to profound respiratory distress. Use of a scale to evaluate dyspnea helps clarify degree of difficulty and changes in condition. Evaluate change in level of mentation. Note cyanosis and/or change in skin color, including mucous membranes and nail beds. Rationale: Accumulation of secretions and/or airway compromise can impair oxygenation of vital organs and tissues. Demonstrate and encourage pursed-lip breathing during exhalation, especially for patients with fibrosis or parenchymal destruction. Rationale: Creates resistance against outflowing air to prevent collapse or narrowing of the airways, thereby helping distribute air throughout the lungs and relieve or reduce shortness of breath. Promote bedrest or limit activity and assist with self-care activities as necessary. Rationale: Reducing oxygen consumption and demand during periods of respiratory compromise may reduce severity of symptoms. Monitor serial ABGs and pulse oximetry. Rationale: Decreased oxygen content (PaO2) and/or saturation or increased PaCO2 indicate need for intervention or change in therapeutic regimen. Provide supplemental oxygen as appropriate. Rationale: Aids in correcting the hypoxemia that may occur secondary to decreased ventilation/diminished alveolar lung surface. Demonstrate progressive weight gain toward goal with normalization of laboratory values and be free of signs of malnutrition. Initiate behaviors/lifestyle changes to regain and/or to maintain appropriate weight. Document patient’s nutritional status on admission, noting skin turgor, current weight and degree of weight loss, integrity of oral mucosa, ability or inability to swallow, presence of bowel tones, history of nausea and vomiting or diarrhea. Rationale: Useful in defining degree or extent of problem and appropriate choice of interventions. Ascertain patient’s usual dietary pattern. Include in selection of food. Rationale: Helpful in identifying specific needs and strengths. Consideration of individual preferences may improve dietary intake. Monitor I&O and weight periodically. Rationale: Useful in measuring effectiveness of nutritional and fluid support. Investigate anorexia and nausea and vomiting, and note possible correlation to medications. Monitor frequency, volume, consistency of stools. Rationale: May affect dietary choices and identify areas for problem solving to enhance intake and utilization of nutrients. Encourage and provide for frequent rest periods. Rationale: Helps conserve energy, especially when metabolic requirements are increased by fever. Provide oral care before and after respiratory treatments. Rationale: Reduces bad taste left from sputum or medications used for respiratory treatments that can stimulate the vomiting center. Encourage small, frequent meals with foods high in protein and carbohydrates. Rationale: Maximizes nutrient intake without undue fatigue/energy expenditure from eating large meals, and reduces gastric irritation. Encourage SO to bring foods from home and to share meals with patient unless contraindicated. Rationale: Creates a more normal social environment during mealtime, and helps meet personal, cultural preferences. Refer to dietitian for adjustments in dietary composition. Rationale: Provides assistance in planning a diet with nutrients adequate to meet patient’s metabolic requirements, dietary preferences, and financial resources post discharge. Consult with respiratory therapy to schedule treatments 1–2 hr before or after meals. Rationale: May help reduce the incidence of nausea and vomiting associated with medications or the effects of respiratory treatments on a full stomach. Monitor laboratory studies: BUN, serum protein, and prealbumin, albumin. Rationale: Low values reflect malnutrition and indicate need for intervention and change in therapeutic regimen. Rationale: Fever increases metabolic needs and therefore calorie consumption. Verbalize understanding of disease process/prognosis and prevention. Initiate behaviors/lifestyle changes to improve general well-being and reduce risk of reactivation of TB. Describe a plan for receiving adequate follow-up care. Assess patient’s ability to learn. Note level of fear, concern, fatigue, participation level; best environment in which patient can learn; how much content; best media and language; who should be included. Rationale: Learning depends on emotional and physical readiness and is achieved at an individual pace. Provide instruction and specific written information for patient to refer to schedule for medications and follow-up sputum testing for documenting response to therapy. Rationale: Written information relieves patient of the burden of having to remember large amounts of information. Repetition strengthens learning. Encourage patient and SO to verbalize fears and concerns. Answer questions factually. Note prolonged use of denial. Rationale: Provides opportunity to correct misconceptions and alleviate anxiety. Inadequate finances or prolonged denial may affect coping and managing the tasks necessary to regain health. Identify symptoms that should be reported to healthcare provider: hemoptysis, chest pain, fever, difficulty breathing, hearing loss, vertigo. Rationale: May indicate progression or reactivation of disease or side effects of medications, requiring further evaluation. Emphasize the importance of maintaining high-protein and carbohydrate diet and adequate fluid intake. Rationale: Meeting metabolic needs helps minimize fatigue and promote recovery. Fluids aid in liquefying or expectorating secretions. Explain medication dosage, frequency of administration, expected action, and the reason for long treatment period. Review potential interactions with other drugs and substances. Rationale: Enhances cooperation with therapeutic regimen and may prevent patient from discontinuing medication before cure is truly affected. Directly observed therapy (DOT) is the treatment of choice when patient is unable or unwilling to take medications as prescribed. Review potential side effects of treatment (dryness of mouth, constipation, visual disturbances, headache, orthostatic hypertension) and problem-solve solutions. Rationale: May prevent or reduce discomfort associated with therapy and enhance cooperation with regimen. Stress need to abstain from alcohol while on INH. Rationale: Combination of INH and alcohol has been linked with increased incidence of hepatitis. Refer for eye examination after starting and then monthly while taking ethambutol. Rationale: Major side effect is reduced visual acuity; initial sign may be decreased ability to perceive green. Evaluate job-related risk factors, working in foundry or rock quarry, sandblasting. Rationale: Excessive exposure to silicone dust enhances risk of silicosis, which may negatively affect respiratory function and cause bronchitis. Rationale: Although smoking does not stimulate recurrence of TB, it does increase the likelihood of respiratory dysfunction or bronchitis. Review how TB is transmitted (primarily by inhalation of airborne organisms, but may also spread through stools or urine if infection is present in these systems) and hazards of reactivation. Rationale: Knowledge may reduce risk of transmission/reactivation. Complications associated with reactivation include cavitation, abscess formation, destructive emphysema, spontaneous pneumothorax, diffuse interstitial fibrosis, serous effusion, empyema, bronchiectasis, hemoptysis, GI ulceration, bronchopleural fistula, tuberculous laryngitis, and miliary spread. Refer to public health agency. Rationale: DOT by community nurses is often the most effective way to ensure patient adherence to therapy. Monitoring can include pill counts and urine dipstick testing for presence of antitubercular drug. Patients with MDR-TB may be monitored with monthly sputum specimens for AFB smear and culture. Note:In some states, there are legal means for involuntary confinement for care if efforts to ensure patient adherence are ineffective.